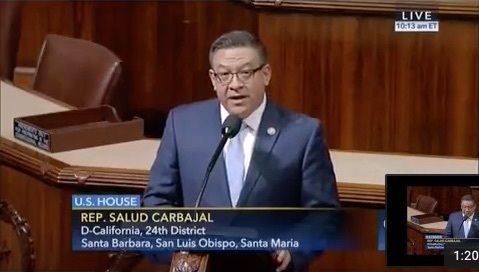 Washington, D.C. – On Tuesday June 27, Congressman Salud Carbajal (CA-24) introduced a bipartisan resolution designating July as “American Grown Flowers Month.” Co-sponsored by Rep. Jaime Herrera Beutler (WA-03), Rep. Jimmy Panetta (CA-20), Rep. Duncan Hunter (CA-50), Rep. Chellie Pingree (ME-01), Rep. Don Young (AK-1), Rep. Jared Huffman (CA02), and Rep. Darrell Issa (CA-49), House Resolution 413 declares July as the month to celebrate the economic and cultural impact of America’s cut flower and greens farmers and demonstrate Congress’ commitment to support America’s flower farming families. Today approximately 77 percent of all flowers sold in the United States are imported. A consumer research study recently found that 74 percent of people had no idea where the flowers they purchased where grown, yet 58 percent of them would prefer to buy homegrown blooms if given the choice. The Certified American Grown program was launched in 2014 to help educate the buying public on the importance of the origin of their flowers. Certified American Grown now certifies hundreds of millions of stems of flowers each year, guaranteeing consumers that the flowers they are purchasing were grown in the United States. Senators Dianne Feinstein and Lisa Murkowski plan to introduce a similar measure in the Senate this week. “We really appreciate Sen. Feinstein and Senator Murkowski on their leadership on agricultural issues generally and cut flower issues in particular in the Senate,” said Kasey Cronquist. About Certified American GrownLaunched on July 1, 2014, Certified American Grown represents a unified and diverse coalition of U.S. flower farms, including small and large entities in multiple states across the country. Certified American Grown flower farms participate in an independent, third-party supply-chain audit to verify both origin and assembly of the flowers they grow. When it appears on bouquets, bunches and other packaging or store signage, the Certified American Grown Brand and logo gives consumers confidence in the source of their flowers and assures them that the flowers they purchase come from a domestic American flower farm. For more information about Certified American Grown flowers, visit americangrownflowers.com or Facebook/AmericanGrownFlowers.